Beginning in 2000, Friends of Harbors, Beaches, and Parks (FHBP) launched the creation of the Green Vision Map. 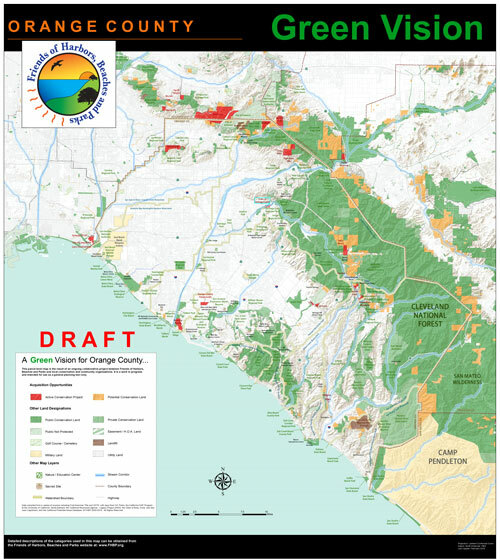 This Map lays out the knowledge and vision of the Green Vision Coalition. In 2012, FHBP acquired parcel level data for the map, including Los Angeles, Orange, Riverside, San Bernardino, and San Diego Counties. With new parcel-level information for the region, the map more accurately reflects ownerships, locations, and acreages. Simultaneously, FHBP established guidelines for what properties got included on the map and for what reasons (i.e., culturally significant sites, endangered or threatened species, rare habitat types, etc.). To submit a property for consideration for the Map, please complete the Property Submission Form. FHBP also added new property categories, including: utility lands, golf courses and cemeteries, homeowners’ association lands, easements, and publicly owned but not protected lands. Download the Property Designation definitions. The map is updated every February. We’ve provided a low and high resolution version for download.